Ann Sidgwick (Treasurer), David Hopkins (Member), John Balshaw (Vice-President), Steven Purton from Dobbies, Kelvin Hack (President), Ken Howells (Member) and Dawn Clark (MK Hospital Charity). 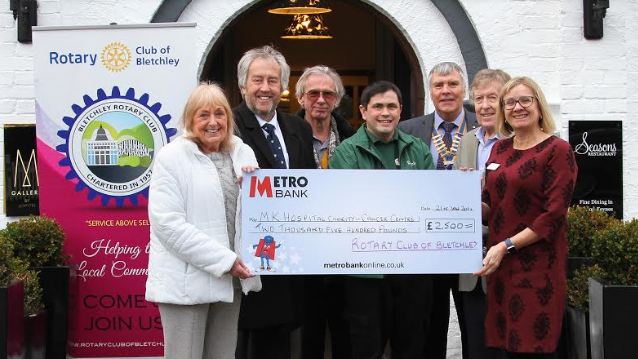 The Rotary Club of Bletchley has donated £2,500 towards the new cancer centre at MK University Hospital. Club members spent six days collecting from local people before Christmas. The hospital’s fund-raising target for improving the ‘look and feel’ of the cancer centre is £2.5m. So far, approximately £1m has been raised but the rest is needed by the end of the year when it is due to open. The Rotary Club of Bletchley meets most Mondays at the Woughton House Hotel for a sociable lunch which usually features talks by guest speakers. You do not have to live in Bletchley to join the club; current members include residents of Aspley Guise, Woburn Sands, Bow Brickhill, Stewkley, and Central Milton Keynes. If you are interested in finding out more please email Ken Howells at RotaryClubofBletchley@outlook.com for further information.